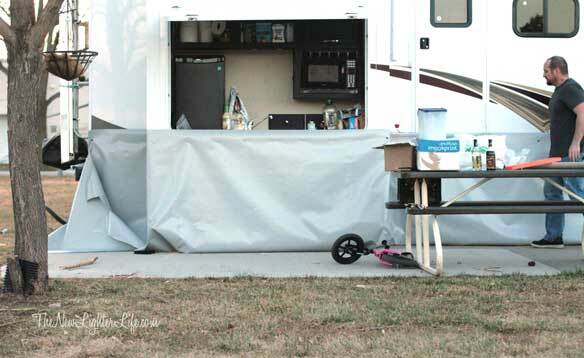 We’ve already covered the skirting options and supplies needed to do vinyl skirting for the RV. Today is our simple step by step. 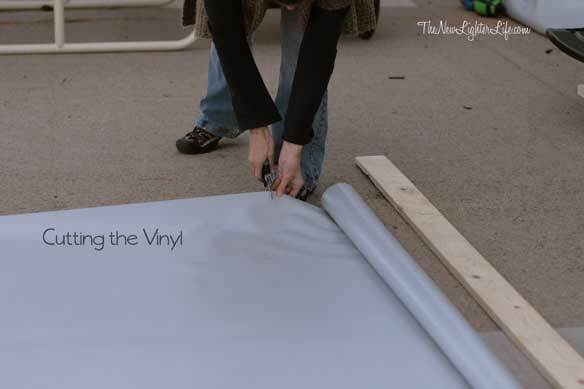 When we planned out our skirting, we decided it would be best to piece the vinyl since it is sold by the yard at 61″ width. Measuring the height around our camper, the most we’d need for width would be 48.” The most. 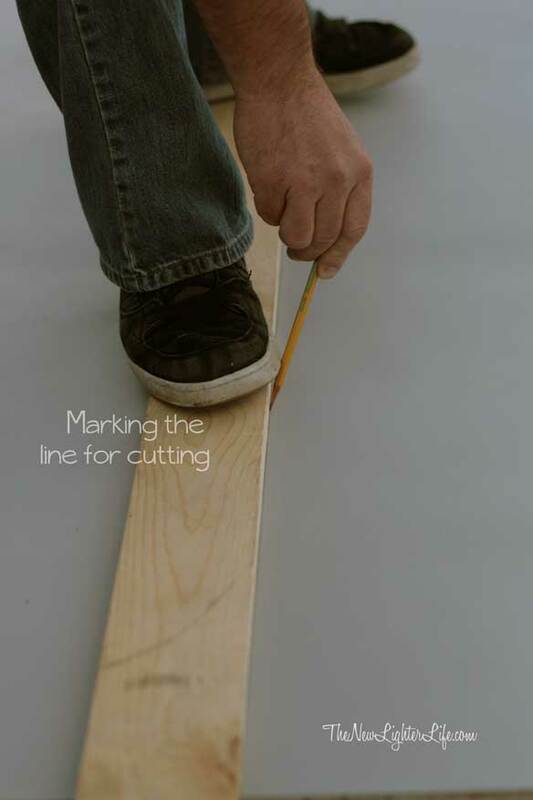 At that width, there is still enough vinyl to tuck under and ensure there are no gaps between the ground and the skirting. We decided to join our pieces of vinyl with vinyl cement. Only, we didn’t order enough of the cement and ended up running out towards the end of the piecing. 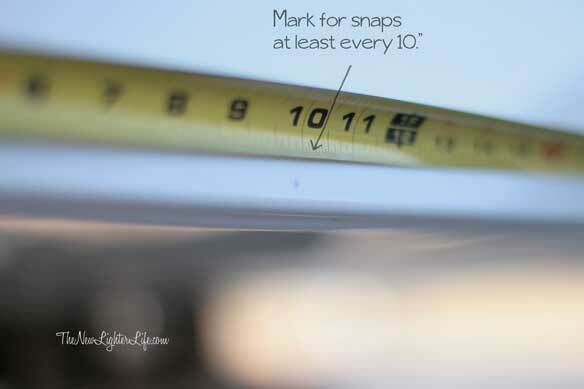 The first thing we did was measure and mark where all the snaps would be placed on the RV. 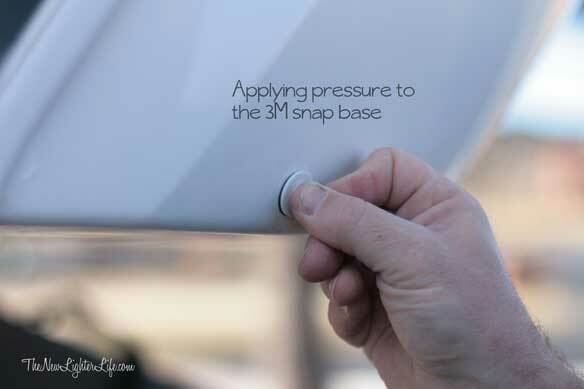 The snaps are suppose to be placed no less than 10 inches from each other and on smooth (non-textured) surfaces, if possible. After measuring and marking, we had to prep the surface since we ordered the 3M Snaps, (to make sure there was no residue and we’d get proper adhesion). To prep, we just wiped the spots where the snaps would be placed with alcohol wipes. Next we peeled the sticky back paper and placed the base piece of the snaps. 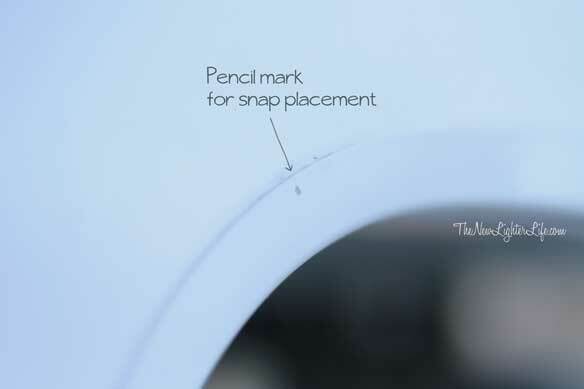 After the sticky back base of the snap, there is a pointy cap that needs to be pressed onto the base, have fun. Your fingers will feel like they are being ripped raw. I have to say, this part was tricky for us. Our 5th wheel end is curved and the wind was blowing like 300 mph that day! But still, we got it attached with the help of L. She stood inside the enclosure to help stop the vinyl from being blown under the camper. She was a trooper. Next, we cut 4 foot lengths of the 61″ vinyl, so we ended up with 4′ by 5′ pieces. 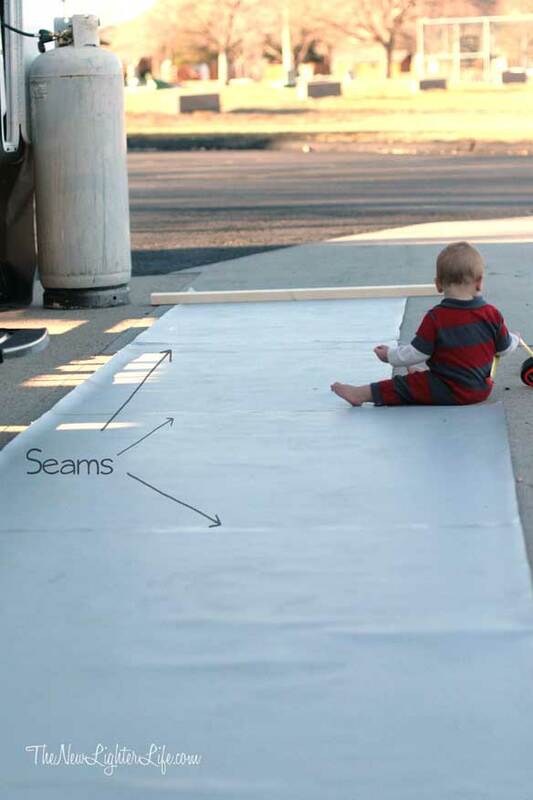 We brushed the vinyl glue onto the seams, which were overlapped by 1″. Those puppies dried in like .001 seconds so we were ables to move quickly. We got about 25 feet of vinyl cut and glued and then worked on getting that section up. For the stairs, we folded them up and cut slits to workaround the metal that comes down. Make sure your height allows for the ups and downs that go with working around access doors and the height of the slides. 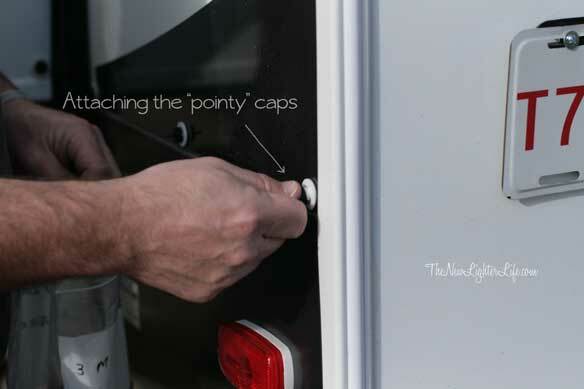 Once the snap caps are on, it’s perminent so you can make adjustments if you need to, just be sure you do so before the cap. We continued to cut and attach sections until we go to the back. There we decided to velcro the piece instead of using vinyl cement. This was done so we could avoid having one humongous piece of vinyl to store and mess with trying to reattach next winter. This is where I discovered my mistake in ordering. We meant to get sticky back velcro, but I got non-sticky back (is that even a word?). 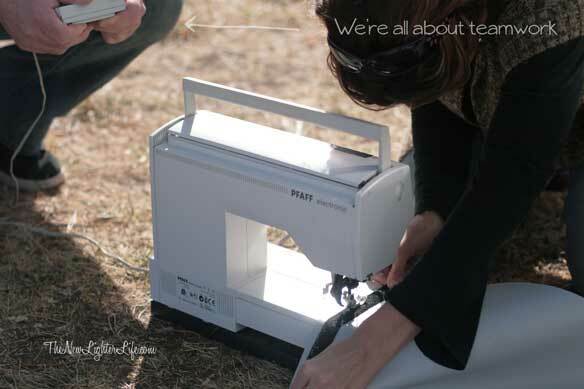 We tried using the vinyl cement to attach the velcro but it didn’t work so we went to the sewing machine to attach it. We continued to cut and cement strips of vinyl, until the cement ran out. We had to postpone finishing the skirting for a couple of days while we tried to find more vinyl cement locally. We tried Menards but no luck. Hobby Lobby had something similar but they it was really expensive, (especially for the amount that we were going to need). Since we had to sew the velcro on with the sewing machine anyway, I convinced Mark that we should just sew the remaining 4 pieces of vinyl. 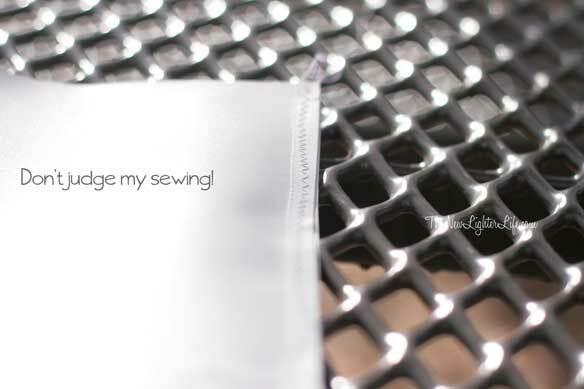 Sewing vinyl is slippery and the feed dogs (for you sewers) doesn’t properly grab the vinyl. Basically we ended up pulling the vinyl through. 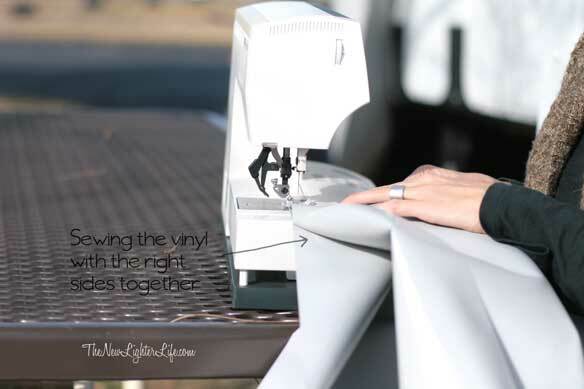 It’s a two man job, so Mark held the heavy vinyl up while I sewed. I cannot say that the job was pretty but it was effective. 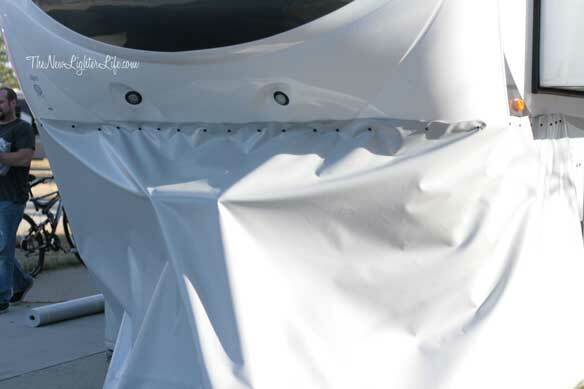 We sewed the vinyl so the seam would be hidden (sewing right sides together and the ugly seam to the inside of the camper when attached to the snaps. Lastly, we trimmed the vinyl that was overhanging. Once we got the skirting all up, we got another blustery day and the skirting was flapping in the wind. It is unbelievably windy here at times and some the skirting actually popped off. Mark got some sandbags and tucked the vinyl under them. Before we had used 2X4s and some of our stowed gym weights. But that proved to be so ineffective against this wind. Over all, we’re ver happy with the skirting. We can see all the mistakes that were made. Some snaps are placed in an uneven pattern but like I said, once you place the 3M part of the snap on, there is NO turning back. I may or may not have placed some in the wrong spot. The skirting is still not completely tidy, and I think that is something we’ll have to accept these winter months. Most definitely. The bench dinette area (which is over a slide) is much warmer and the overall floor doesn’t feel near as chilly. Before it was mighty cold in that area. 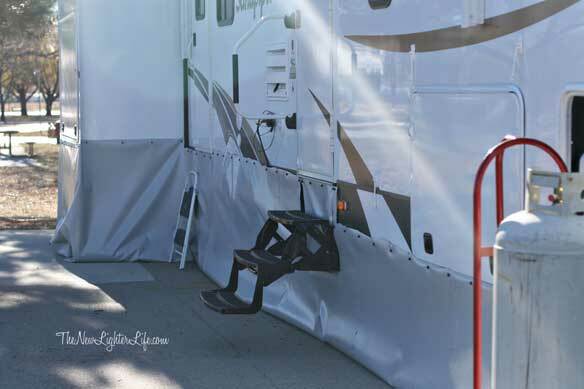 There you have it, our take on Vinyl Skirting the RV. I’d estimate overall, it took us about 6 hours to do the skirting. **UPDATE** We have had some added issues with our skirting which we address, here. I’ve enjoyed reading your skirting adventure. We are putting together a “hints” area for the do it yourselfers, (we cannot skirt the world). If you have any other hints you would like to share please pass them on. Your pictures and descriptions are quite awesome. We don’t sell just the supplies, our shop is very small and not much room for inventory so it was interesting to see where yours came from and how you used it all. Thank you for putting our link on your website. I to have tried to glue Velcro in a bind! 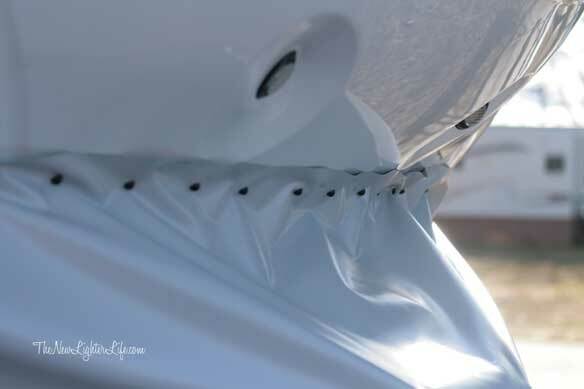 So I was thinking about this.. to help fix your wind problem you could put eyelets in the bottom of the vinyl and stake it down.. Thank you for the suggestions. Mark mentioned something similar! I’ll pass it on to him.